A face with wide open eyes and pupils, blushing cheeks, small closed mouth and eyebrows. 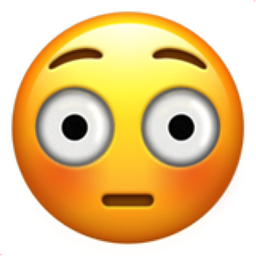 This Emoji is embarrassment. Apparently this Emoji is supposed to mean Embarrassment. Could also mean: Bug-eyed straight face, Can't believe what just happened. iEmoji old name: WHAT?? ?